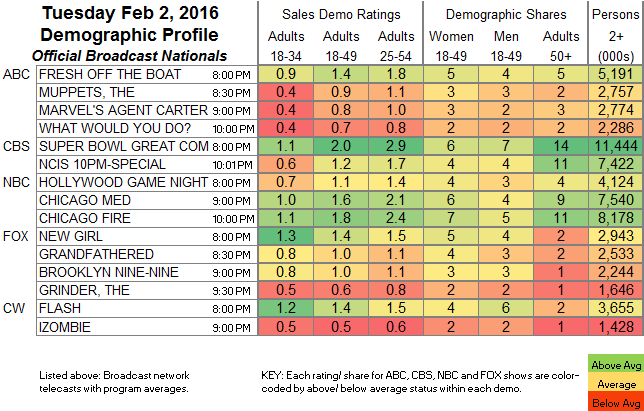 NETWORK FINALS: THE MUPPETS managed a precious 0.1 bump in final numbers, although that was still a series low. IZOMBIE, though, fell 0.1. CABLE HIGHLIGHTS: FX’s AMERICAN CRIME STORY: THE PEOPLE VS. OJ SIMPSON premiered at 1.96, the night’s easy winner. However, that was considerably below the 2.99 score for last fall’s season premiere of AMERICAN HORROR STORY. Perhaps unsurprisingly, CRIME skewed much older than HORROR, with 18-34 scores of 1.64 vs. 3.57, but 50+ ratings of 2.22 vs. 1.22. In the long term, though, that could make CRIME’s ratings more stable than HORROR’s have tended to be. The show held its audience quite well during its initial run, with 1.92 in its 1st quarter-hour and 1.89 in its last (technically, it drifted to 1.76 in the final 6-minute 11:15-11:21PM segment, but most of those 6 minutes were commercials and the trailer for next week). Elsewhere, History’s CURSE OF OAK ISLAND gained 0.11 to 1.04, with lead-out BILLION DOLLAR WRECK at 0.46. HGTV’s FIXER UPPER lost 0.07 to 0.82, and HOUSE HUNTERS INTL fell 0.13 to 0.37. On History, MOONSHINERS was up 0.02 to 0.75, and KILLING FIELDS was off by 0.06 to 0.45. OWN’s HAVES AND HAVE NOTS dropped 0.09 to 0.74. On Bravo, REAL HOUSEWIVES OF BEVERLY HILLS gained 0.05 to 0.72, and GIRLFRIENDS GUIDE TO DIVORCE was down a hundredth to 0.25. On Freeform, PRETTY LITTLE LIARS fell 0.16 to 0.63, and SHADOWHUNTERS held up well considering that, down 0.04 to 0.41. 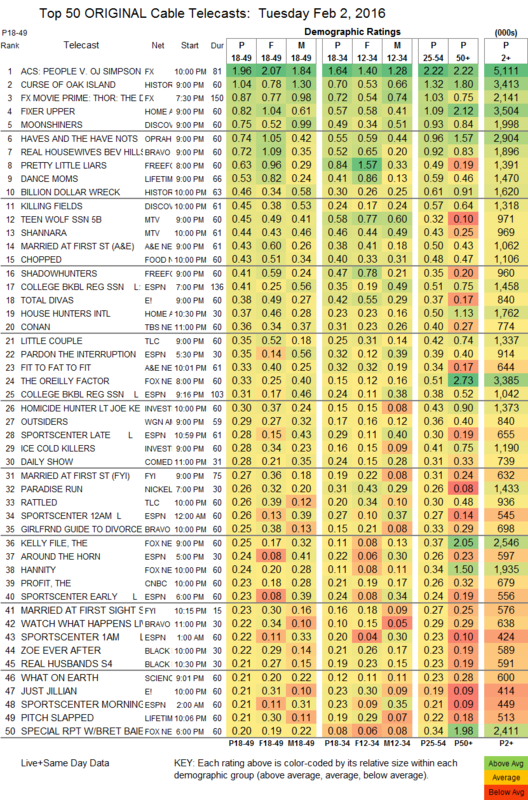 On Lifetime, DANCE MOMS ticked down to 0.53, and PITCH SLAPPED lost 0.04 to 0.21. On MTV, TEEN WOLF ticked up to 0.45, and THE SHANNARA CHRONICLES dipped 0.05 to 0.44. On A&E, MARRIED AT FIRST SIGHT was down 0.05 to 0.43, and FIT TO FAT TO FIT thinned by a hundredth to 0.33. Food Network’s CHOPPED was steady at 0.43. On E!, TOTAL DIVAS was down 0.04 to 0.38, and JUST JILLIAN ticked up to 0.21. WGNAmerica’s OUTSIDERS slipped 0.04 to 0.29. TLC’s RATTLED was at 0.26. On BET, ZOE EVER AFTER fell 0.06 to 0.22, and REAL HUSBANDS OF HOLLYWOOD dropped 0.09 to 0.21. Syfy’s THE EXPANSE dropped 0.06 to 0.20. POP’s IMPACT WRESTLING fell 0.04 to 0.09 (the re-airing was up 0.01 to 0.05/112K).